As a sophomore last year, Donte Clark proved he has some big time game. The 6’4″ guard made his presence felt early in the 2015-16 season as he scored 25 points in a win over Clemson. Clark continued scoring at a prolific rate throughout the season as he dropped over 15 points in 18 games. As an athletic wing, Clark also contributed on the boards. He pulled down four rebounds or more in 17 of the Minutemen’s games last year. 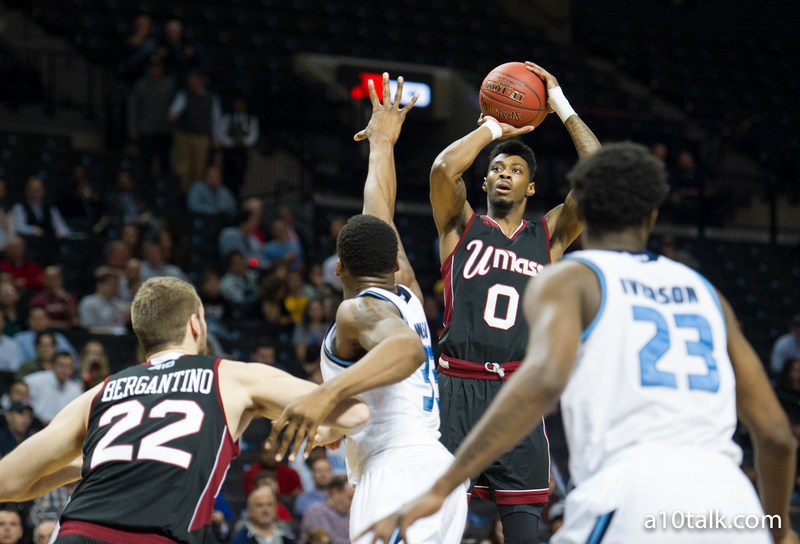 Clark averaged a total of 16.1 points, 3.8 rebounds, and 2.3 assists for UMass one season ago. Although UMass finished with a 14-18 record, Clark did all he could to carry the Minutemen. With a highly talented recruiting class coming in, expect UMass to reach new heights this year with Clark leading the way. Clark told me he wants to be the best player he can for his teammates; when Clark is at his best, his teammates follow. Rather than focus on individual accomplishments, Clark says he wants to let his game continue to speak for itself. Now entering his junior season, Clark must step up and lead the Minutemen. Along with putting up impressive numbers, UMass’s star upperclassman will need to bestow a winning mindset upon the rest of the team. Even though the season has not started yet, it appears Clark will look to do just that. Clark is setting the bar high for the Minutemen this year as he told me, “As a team we plan on proving to everybody that we are one of the best teams, if not the best team in the A-10. We also plan on making it to the NCAA tournament this year.” With high expectations and a true belief amongst those around the UMass program, expect the Minutemen to be much improved this season. While Clark may not concern himself with individual awards, a few could come his way this year. If Clark continues to improve, he could easily find himself making one of the All A-10 teams at the end of the season. As the Minutemen’s star player, opposing teams will have to game plan around Clark. With the ability to drop 20 plus on any given night, expect Clark to lead UMass to more success this season while receiving individual recognition.